As a non-string-player, my own experience of string quartets has been relatively limited; it’s a form I’ve often tended to overlook in favour of orchestral or choral music. This week, though, came an album that couldn’t so lightly be passed over – the London Haydn Quartet’s double-bill of, well, Haydn quartets (the ensemble is, indeed, well named). There are, of course, a lot of Haydn string quartets to choose from – this double-disc set focuses in on Opp. 54 and 55, which show a particular snapshot of Haydn’s style and certain recognisable hallmarks. In these six quartets we hear Haydn at the height of his powers – a successful, sought-after composer, popular in the bustling and cosmopolitan environment of 1788 Paris. One thing that sets these quartets somewhat apart from Haydn’s others is the high tessitura and extrovert nature of the first violin parts – particularly in the first two of Op. 54 and the first of Op. 55. This has fuelled speculation that they were written specially for the violinist Johann Tost, though there’s also a less anecdotal explanation that I personally find more convincing – Haydn was responding, at least partially, to the musical fashions of ancien régime Paris. At this time the preference there was for quartets that exalted the first violinist over the other three players – the so-called quatuor brillant, more of a chamber concerto than a quartet of equals – and while Haydn doesn’t buy into this trend to the extent of sacrificing the interplay of parts that makes his quartets so lively, its influence is clearly audible. As ever, Haydn uses these quartets as vehicles to explore the potential that the form offers – far from being simply six boilerplate pieces of wallpaper music, they all contain quirks and deviations from the norm that catch the ear and constantly force the listener to revise their expectations of where the music is going. Irregular phrases, discordant minor-key passages, rapid modulations via distant keys, and even dramatic use of silence – all evidence of a composer never content to sit back and rest on his laurels. Any one of these quartets places a wide range of emotions on aural display, and the set of six is a true tour de force for any ensemble that prides itself on its flexibility – from the boldly confident openings of the A major Op. 55 or G major Op. 54 to the wistful first movement of the F minor ‘Razor’ quartet and its unsettling, disjointed second movement. 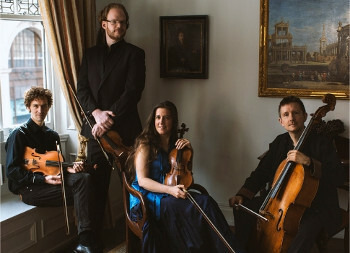 It should come as no surprise that the London Haydn Quartet, who have after all made it their mission to perfect the period performance of Haydn’s quartets (with gut strings as well as a historically-informed mindset), handle all these twists and turns with aplomb. In the three more brillant-leaning quartets the playing-style (especially, of course, from first violinist Catherine Manson) is more extrovert; in the other three the conversational aspect of this endlessly varied genre comes to the fore. Where a rollicking finale is called for (as in the ‘Razor’), there’s a winning combination of precision, lightness of touch and, at the right moments, boisterous fun; elsewhere, in the slow movement of the C major quartet Op. 54, there’s a beautiful transition from wistful melancholy (complete with what, to modern ears, sounds very much like a blue-note-inflected motif) to a kind of quiet elation. A reproduction in the sleeve notes of a poster advertising a performance of these quartets serves as a reminder of their context – we have moved beyond the realm of mere bourgeois amateur private music-making. In these quartets we see some of the early stirrings of the quartet as concert music in its own right. This, I think, accounts for their adventurousness – no longer is this music written to be playable first and interesting second, as might uncharitably be said of some other quartets, but rather the reverse. Haydn is off the leash, and his witty and at times subversive approach to established form is in full flower. A fantastic addition to any chamber music fan’s collection, and an excellent introduction to the genre for those who’ve yet to explore it.